The government’s aim of achieving this year’s target of inflation rate and economic growth seems like a pipe dream as the government tackles soaring petroleum prices and the strong US dollar, said economists. The government through the budget announcement has set an ambitious economic growth target of 8 percent for the current fiscal year. Similarly, the monetary policy for 2018-19 talks about maintaining the inflation rate at 6.5 percent. However, in just one and a half month since the new fiscal year began, the government has been under pressure with the domestic currency falling against the US dollar. The central bank has fixed the price of one US dollar at Rs117.07 for Wednesday. Compared to the beginning of the current fiscal year that started on mid-July, the Nepali currency has depreciated almost Rs8 a dollar. Likewise, the situation has further worsened with soaring petroleum prices in the international market. 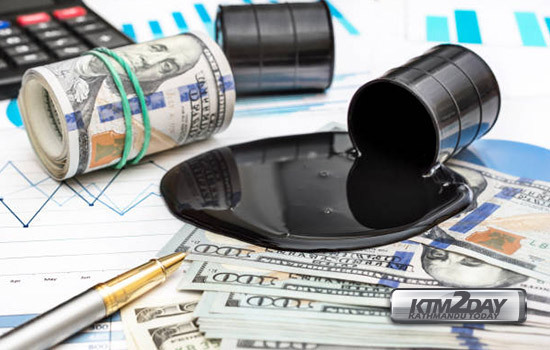 On Sunday, the price of crude oil stood at $76.83 per barrel in the international market. And with Nepal adopting an auto pricing policy in petroleum products, the domestic market has witnessed a surge in oil price by nearly 10 percent in the past few months. Madan Dahal, an economist, said the government would have a hard time meeting the target of economic growth and inflation rate this year. “If the prices of both the dollar and fuel remain on the higher side as they are at present, it will impact consumers significantly while also affecting potential investors from the private sector,” said Dahal, adding that the soaring price also affects capital formation in the larger context. The country’s consumer price index largely depends on the Indian market as almost 65 percent of the country’s trade is with the southern neighbour. Of the total imports from India, consumer items make up the lion’s share. In this regard, consumers will have to allocate a larger proportion of the household budget for consumption. Another Economist Dipendra Bahadur Chhetri also echoed Dahal, stating that in the new scenario, both import and transport costs will rise significantly. “Its impact will start to appear mainly from Dashain, which is almost round the corner,” Chhetri said. Although the depreciation of domestic currency might propel the remittance inflow, it equally increases the family budget size for consumption, according to Chhetri. “Likewise, the government will also need more money to settle the interest and principle amount of foreign debt, draining out all the possible fund for capital expenditure in paying the foreign loan,” he opined.